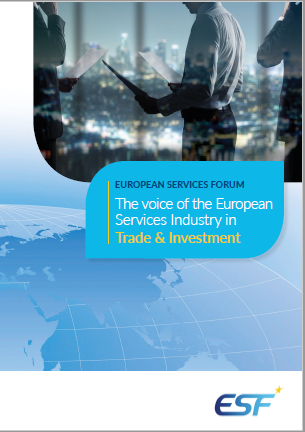 All activities | "The Voice of the European Services Sectors in International Trade"
The European Services Forum (ESF) is a network of representatives from the European services sector committed to actively promoting the liberalisation of international trade in services. ESF’s main field of activity are the WTO GATS negotiations and the EU’s bilateral trade negotiations on services and investments. ESF Chairman Sir Thomas Harris sent today, Tuesday 5 May 2015 to the European institutions the views of the European service industries on the issue of Investment protection and Investor-State Dispute Settlement (ISDS) mechanism. ESF expressed the services companies great concerns raised by the recent position of the S&D Group as well as by some EU Member States representatives against the inclusion of ISDS in TTIP. Investment is about trust. Investment protection, including the right to defend it through a neutral dispute settlement, provides that trust. ESF is strongly in favour of having a state of the art ISDS mechanism in TTIP and in any other agreement which will include investment protection rules. Find the letter here. Find also some facts and figures in this “ISDS in One Shot“. More than 30 business delegates from various TiSA countries rallied to Geneva to meet TiSA countries negotiators and ambassadors to express their support for ambitious progress in the negotiations during the 12th Round of talks (13-17 April). At this occasion, the Global Services Coalition adopted a Joint statement in which “they urge that efforts be made to bring commitments within TiSA to the standard of the “best of the best” commitments within the existing FTAs, both in the interests of greater uniformity and to maximise TiSA’s value as a model for multilateralisation”. Find Joint Statement Here. More than 130 participants attended the luncheon event organised by ESF and the Think-tank CEPS on Wednesday, 25 March 2015 in full CEPS Conference room on the theme “Why Services are critical in TTIP”. You can find the programme here, which gathered speakers from ESF, CEPS, ACE, IBM and the European Commissions TTIP Services Negotiator. The presentation of ESF Director Pascal Kerneis can be found here, and the one of Ian Prichard, Secretary General of the Architects Council of Europe (ACE) here. ESF joined other European business associations (BUSINESSEUROPE, DIGITAL EUROPE, European Banking Federation, EUROCHAMBRES, and TheCityUK) in a letter addressed to many Vice-Presidents and Commissioners of the European Commission, calling them to take action regarding the recent decision by the the Chinese Government to adopt and implement “Guiding Opinions on the Application of Secure and Controllable Information Technology to Strengthen Banking Industry Network Security and Informatisation”. That regulation will shut the door for many foreign ICT companies to the Chinese banking IT market by requiring that banks procure “secure and controllable ICT” for up to 75% of their networks and systems. European banks present in China will have to completely reshuffle their ICT system to be in compliance with the guidelines. The letter can be found here. International Trade Committee (INTA) of the European Parliament held a Public Hearing on the Trade in Services Agreement (TISA) on 24th February 2015 (see programme). ESF Managing Director presented the views of the European services industry on the market access and rules pillars, and going through the 5 blue lines and 5 red lines expressed by the Rapporteur on TISA, Ms Viviane Reding on 13 January 2015 at a press conference. The presentation is here. ESF made a presentation on “Regulatory Cooperation in TTIP: What’s in for services?” at the Stakeholders Event organised by the TTIP negotiators at the occasion of the 8th Round (see Programme). Services represent more than 75% of the EU-US GDP and more than 35% of EU-US trade in services, so TTIP must ensure regulatory cooperation process also for services sectors. Presentation is here. ESF Managing Director Pascal Kerneis made a presentation at the European Economic and Social Committee (EESC) on 3rd February at a Hearing in the framework of the preparation of the EESC opinion on ” Investment Protection and ISDS in EU Trade and Investment Agreements”. You can find the presentation here. The Business Alliance for TTIP, gathering AmCham EU, AmCham in EU Member States, BUSINESSEUROPE, ERT, EuroChambres, European Services Forum (ESF), Transatlantic Business Council (TABC), the Transatlantic Policy Network (TPN), UAPME and US Chamber organised a cocktail reception to welcome the new EU Trade Commissioner and hear her update on the Transatlantic Trade and Investment Partnership (TTIP) on 2 February 2015, the first day of the 8th Rounds of talks between the EU and the US. more than 400 participants attended the event that took place at the Representation of the Free State of Bavaria to the EU in Brussels. Ahead of the 8th TTIP Round next week (2-6 Feb 2015) in Brussels ESF signed a Joint Statement by EU and US business organisations with cross-sector representation as well as financial services and related professional trade associations that was sent earlier today (30 January) to the EU and US Chief negotiators and other relevant policymakers reiterating our view that TTIP must both address financial services market access and establish a financial services regulatory cooperation mechanism. On the day of the publication by the European Commission of its report on Consultation on investment protection in EU-US TTIP trade negotiations (13 January 2015), the Business Alliance for TTIP, to which ESF contributes, published an Op-Ed in the web media EurActiv:http://www.euractiv.com/sections/trade-society/trading-and-being-treated-fairly-why-european-industry-needs-investment. On the same day, ESF also co-signed a Joint Associations Statement in support of investment protection and ISDS in TTIP. The European Business Alliance for TTIP issued today, 30 September 2014, a joint statement on regulatory cooperation in TTIP as a message to the TTIP negotiators who are meeting in Chevy Chase (Maryland) near Washington for the 7th Round of talks. The members of the Alliance “reaffirm our support for an ambitious and comprehensive agreement, including strong provisions on regulatory coherence and cooperation both at the horizontal and the sectoral level” says the statement. “Today, too many duplicative and unnecessary hurdles remain for imports and exports of goods and services between us. We need to build on the strengths of our respective regulatory systems by enhancing coordination between regulators; improving transparency, participation and accountability; and advancing greater compatibility between the systems”. At the occasion of the Trade in Services Agreement (TiSA) week of negotiations in this 4th week of September 2014 in Geneva, Ten coalitions of services industries have adopted for the first time an in-depth Position Paper, where they expressed their common views on the services only plurilateral talks. The Global Services Coalition expresses its strong support for an ambitious and future-oriented agreement. They believe that TiSA will significantly boost the growth prospects for this vital sector of the global economy, but yet too much neglected in trade negotiations. The Paper provides a common input on the various issues that currently are being negotiated under TiSA: better market access commitments in all modes, better horizontal and sector specific disciplines, etc. ESF adopted its Position Paper on Business Support for Key Principles in Bilateral Investment Agreements on 23 May 2014. The EU is by far the world’s largest source and destination of FDI measured by both stocks and flows. European services businesses have invested nearly €3 trillion outside the EU, which must be strongly legally protected. The Paper analysis in details the various priorities of the European Services Industries related to the protection of their investments in the framework of trade policy. This is a Position Paper that looks at investment protection in general. A special Global Services Coalition mission was in Geneva as the latest Trade in Services Agreement (TiSA) negotiating round that took place on 28 April-2 May 2014. Its delegates, representing the Coalition’s diverse membership voiced their strong support for the efforts of the TiSA participants – now nearly a third of the WTO membership – towards an ambitious agreement, and to share views with TiSA negotiators. The GSC issued a joint statement calling the negotiators to continue focussing on an ambitious agreement. The timetable should aim at completion of negotiations by 2015 – a schedule that is challenging but, the GSC suggests, achievable. ESF, in a letter to all EU Trade Ministers, called upon the European Union to clearly recommend the continuation of the negotiations, so that all economic sectors will have a chance to benefit from the EU-Japan FTA, which should reach a balanced but ambitious result. ESF encouraged the EU Commission and the Member States, when assessing the progress made for the mandated “one-year review” to take into consideration not only improvements made on the NTBs roadmap, but to also analyse the benefits of liberalisation and high-standard commitments on all negotiated issues, including services, that could be achieved through the conclusion of a deep and comprehensive FTA with Japan. ESF also joined a EU business joint statement – issued at the occasion of the EU-Japan Summit to take place on 7th May in Brussels – calling upon the EU to clearly recommend the continuation of the negotiations, so that trade issues relevant to all economic sectors from across the EU can be addressed in the talks and not only those of the sectors listed in the roadmap. At the occasion of the Fourth round of the Transatlantic Trade & Investment Partnership, the European Commission organised the “Stakeholder Presentations Event” on 12th March. It gave the opportunity to more than 90 organisations to present their views on TTIP (Programme). The European Services Forum and some of its members presented their priorities in the third session of the programme dedicated to “Issues related to services, investment and public procurement”. You can find ESF (speech & slides) and some ESF Members’ presentations (including from banking, telecoms, legal, accounting services, etc.) in the TTIP section of this website. More than 70 persons participated to the Seminar organised by ESF and ECIPE on “Investment in china: China’s “New” Reforms and the Role of Services?” that took place in Brussels, on 13 February 2014. Despite China’s economic upgrade, the share of services in the Chinese economy or employment is still similar to some least-developing countries. Many doubt that employment, growth or welfare can be boosted in China without substantive reforms of the services markets. The recent Third Plenum statement on coming reforms detailed ambitious intentions on financial reforms, foreign investments and liberalisation of utilities, including transports and telecoms. However, many still doubt China’s ability to open up: there are many questions around China’s intention to join the Trade In Services Agreement (TISA) negotiations, or China’s willingness to address its foreign equity caps through investment treaties. 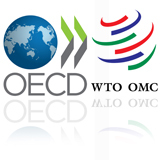 Following the announcement of a political deal in WTO MC9 in Bali on 7th December 2013, ESF Chairman Sir Thomas Harris commented the news by saying: “We are glad that the trade ministers in Bali have finally reached an agreement after tough talks in the last months and last hours. This historical moment will give back some shine to the World Trade Organisation. Today’s deal will save the WTO since it will allow it to pursue its essential negotiating role”. The European services industry is a strong supporter of the adoption and implementation of the Trade Facilitation package, since it is services companies that are carrying and clearing all these world trade goods across the borders and it is the services companies that are in charge of spreading out the imports and exports to the final consumers; and to business suppliers who often wait a long time for equipment which is essential to supply services to other businesses in the global value chain. See ESF Press release here. On 21st November, more than ten business organisations from all parts of the world (incl. ESF), believing that the consensus-driven negotiations and the progress made in the last weeks on the Draft Agreement on Trade Facilitation now have sufficient shape to be concluded and implemented, for the good of all economies, called on all developed and emerging economies to take significant step to finalise the deal with the least possible derogations or transition periods and commit to help poorer countries in achieving their customs reforms. ESF has signed a joint statement endorsed by a group of 20 business organisations concerning the upcoming 21st EU-Japan Summit, which will take place in Tokyo on 19th November 2013. The signatories represent a wide range of European industry and service sectors, and have issued this joint statement to reiterate their strong support for the negotiation of a deep and comprehensive FTA between the EU and Japan. On 31st October 2013, the Global Services Coalition presented a joint communiqueas the conclusion to their meeting following the Global Services Summit. The GSC supports consultations between the existing TiSA parties and the Government of China to explore China’s participation in the TiSA at a level of ambition that matches and accepts the demanding goals set by the existing participants. “We believe that one of the ways in which China can demonstrate its commitment to the level of ambition required is by accepting the already agreed core TiSA text and disciplines and by agreeing to table a high level initial offer going very significantly beyond its current GATS schedule and aiming at removing remaining market access impediments in services.” says the communiqué. The communique also reiterates the importance of countries reaching agreement at the upcoming WTO Ministerial in Bali, Indonesia, as well as the important role services play in the global economy. On 18 October 2013, the European Services Forum (ESF) welcomed the political agreement that Commission President Barroso and Canadian Prime Minister Harper have made on the Comprehensive Economic and Trade Agreement (CETA). This is an important moment for the European trade policy, with a major modern agreement with a strong developed economy. ESF Managing Director Pascal Kerneis commented the news by saying: ‘We are glad that the trade negotiators finally reached an agreement after tough talks in the last months. We were eager that the last difficult issues on agriculture products would not jeopardise the overall tremendous progress achieved in this agreement. The deal will provide better market access to European and Canadian services companies, with strong regulatory disciplines for market access, for investment and open public procurement at all levels. We encourage both parties to finalise the agreement as soon as possible and will monitor closely its ratification.’ In 2012, European services companies exported 16.8 Billion € of services to Canada. In a letter sent to Commission President José Manuel Barroso and Canadian PM Stephen Harper ESF, with other EU and Canadian business organisations, called for a rapid and successful conclusion to the Comprehensive Economic and Trade Agreement (CETA). The joint letter was sent on 10th October 2013. The Global Services Coalition (GSC) gathering services organisations from Australia, Canada, Europe, Japan, Hong-Kong, Taiwan, UK and US adopted a joint letter on their common priorities for the on-going Trade in Services Agreement (TiSA) negotiations. The letter has been sent on 5th September to the trade ministers and their respective WTO Ambassador in Geneva, ahead of the TiSA negotiating round that took place in Geneva in the week of 16th September 2013. TWCSI invited Mr. Pascal Kerneis, Managing Director of the European Service Forum to Taipei on 3rd June 2013, to share the European point of view on the plurilateral service agreement, now formally called Trade in Services Agreement (TISA), and future cooperation between Taiwan and the EU. Mr. Kerneis also met with government agencies including Mr. Chun-Fu Chang, Director General of the Bureau of Foreign Trade (BOFT) and Ms. Jenny Yang, Deputy Representative of the Office of Trade Negotiations (OTN) of the Ministry of Economic Affairs to discuss about EU-Taiwan trade relations, and the process of TISA. He also visited Mr Freddy Hoeglund, CEO of the European Chamber of Commerce Taiwan (ECCT), and exchanged opinions on trade and investment issues. Also, Mr. Kerneis gave a speech on TISA that TWCSI and the Chun Hui Institite for Economic Research jointly held to discuss about service trade in EU, and the possible development of TISA.. Mr. Roy Lee, Deputy CEO of the WTO and RTA center and Mr.Steven Tan, Lawyer at Baker & McKenzie were invited as the chair and panelist of the seminar. The recently launched FTA negotiations with Japan were the major reason why it was felt important to meet the various interlocutors in Tokyo. ESF Director attended a programme kindly organised by the European Business Council in Japan (EBC). Mr Kerneis met successfully the European Commission delegation, some European services companies’ members of the EBC, the Japan Services Network and Keidanren, the Japan-EU FTA negotiators of the Ministry of Economic and Trade and Industry (METI), and of the Ministry of Foreign Affairs (MOFA). 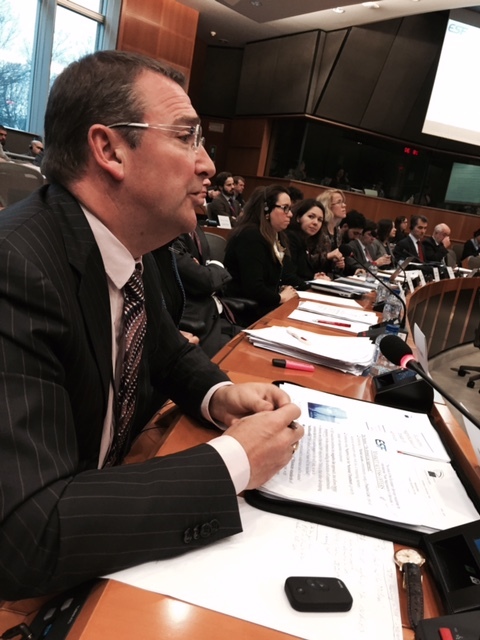 It was an opportunity to highlight the importance of the services chapter in the forthcoming agreement. The majors trading barriers that service companies encountered were highlighted (Japan Post and its discriminatory treatment in banking, insurance and express courier, Distribution services, Legal services, residency requirements, heavy regulatory burden, etc.). The EBC Chairman, Mr. Duco Delgorge, strongly invited the European Services Forum to continue to work with EBC during the negotiations, so as to gather our strength and push the negotiators towards similar priorities and results. The second UNCTAD Global Services Forum (GSF) took place in Beijing on 28 & 29 May. It gathered around 500 participants, including many ministers and trade officials from more than 50 countries, essentially from developing countries: see: http://unctad.org/en/conferences/gsf/2013/pages/home.aspx. ESF Chairman was invited to speak at the closing ceremony ministerial level summit (see programme and list of speakers), where he delivered a speech calling for more countries to join the Trade in Services Agreement (TISA). The GSF was organised in the overall framework of the second CIFTIS (China International Fair in Trade in Services), a major event in the Chinese capital, with more than 150 activities (ceremonies, summits, forums, business talks, comprehensive exhibition, and theme day’s activities) were held around the 12 sectors of trade in services of the GATS. More than 2000 exhibitors and more than 30 000 registered merchants from more than 100 countries and regions around the world have attracted an accumulative total over 120 000 professional visitors in the fair (see website of www.ciftis.org). It was in this joint framework of “GSF-CIFTIS LEADERS SUMMIT” that took place in the Great Hall of the People that Chinese Prime Minister Li Keqiang, pronounced its key note speech, explaining China priorities in trade in services for the next five years. On 16th May, at the context of the 11th European Business Summit, BUSINESSEUROPE, EUROCHAMBRES, the European Services Forum, the European Association of Craft, Small and Medium-Sized Enterprises (UAPME), the Transatlantic Business Council (TBC), the Transatlantic Policy Network (TPN), the American Chamber of Commerce to the EU, AmChams in Europe and the US Chamber of Commerce launched the Business Alliance for a Transatlantic Trade and Investment Partnership (TTIP). On 25 April 2013, ECIPE, Business Europe, and the European Services Forum (ESF) organised a workshop on servicification, or “why services trade matters to EU manufacturing”. Competitiveness of EU manufacturing is increasingly dependent on services. Logistics, maintenance, consulting, financing and data processing are integral part of any competitive offering in technology, machinery, processing and consumer businesses. Efficient services consumed by the manufacturing companies in their daily operations are also an integral part of their competitiveness. Services provided and consumed by EU manufacturing contribute to a significant share of their incomes. Services have transformed the way goods are traded while digitalisation has turned many goods into services – a concept we call servicification. The speakers contributed to bring responses to the following questions: How does the market access for goods depend on openness on services? What are the policy implications of servicification, and which services barriers should be in focus? What could the new major FTAs deliver for EU manufacturing, especially in terms of services liberalisation? The European Services Forum (ESF), together with BUSINESSEUROPE, DIGITALEUROPE and the European Telecommunications Networks Operators Associations (ETNO) sent aJoint Letter on 20 December 2012 on India Preferential Market Access in public procurement to the prime minister of India, as well as to three other ministers dealing with this issue. The signatories strongly urge the Indian Government to halt the implementation of the PMA Mandate for private sector procurements, specifically the October 2012 telecom notification. Applying PMA to private sector procurements would constitute an unprecedented interference in the private sector and calls into question India’s fundamental WTO commitments to not discriminate against foreign products. A similar letter was also sent to Commissioner De Gucht, Kroes and Tajani and the relevant officials in the Commission. ESF is pleased to see further progress in the on-going preliminary discussions in Geneva and calls for all parties concerned to ensure that the current momentum will not be lost in technicalities. The resulting agreement should be ambitious, flexible, and inclusive, with the goal of attracting the largest number of participating countries as possible. ESF has developed a Position Paper where it expresses the European services industry priorities in the forthcoming negotiations for a plurilateral services agreement and sent it to the relevant interlocutors on 12 November 2012. On 22 October 2012, ESF signed a joint letter with BUSINESSEUROPE, the Canadian Services Coalition (CSC), the Canadian Chamber of Commerce and the Canada Europe Round Table (CERT), calling for the conclusion of the CETA negotiations, and listing the major prioroties for businesses in this trade deal. ESF joined many sector specific European trade associations to call the Trade Ministers of the Euroepan Union, who will gather in EU Forfeign Affairs Council on 29 November, to provide a mandate to the European Commisison to launch the trade negotiations with Japan towards a deep and comprehensive agreement. See Joint letter here. On the 10th July 2012, ESF sent a letter to Commissioner for Trade Karel de Gucht outlining the full support of the European Services Industry for the launch of trade negotiations with Japan. ESF supports the launch of negotiations at the earliest appropriate time where trade and investment in services will constitute a prominent part of any concluded agreement. ESF’s support stems from the fact that negotiations will be the most realistic approach to removing the types of problems faced by European services companies in Japan, notably concerning complexity and regulatory and transparency issues, in addition to more traditional trade barriers. ESF also believes that bilateral trade negotiations are an excellent opportunity to increase access to the large Japanese Public Procurement market at central and sub-central level. On the 26 April 2012 the ESF Managing Director attended the annual EU-MCCI “EU-Malaysia Trade Forum” in Kuala Lumpur. The theme was “Enhancing Cooperation: Innovation, Industry and Investment” and commenced with a plenary session on the services sector — generating investments in targeted growth areas. The ESF Director gave the Plenary speech, just after the Opening Remarks of Ambassador and Head of the EU Delegation to Malaysia, His Excellency Vincent Piket, and the Keynote address of the Secretary General (Trade) of the Ministry of International Trade and Industry (MITI), Datuk Dr. Rebecca Fatima Sta Maria, who is also the Malaysian Chief Negotiator for the on-going EU Malaysia FTA. The programme can be found here. In its media statement the Global Services Coalition congratulated UNCTAD and its co-sponsors, the Commonwealth Secretariat and the Talal Abu-Ghazaleh Organisation (TAG-Org), for hosting a Global Services Forum as a pre-event under the auspices of UNCTAD XIII in Doha. The Global Services Coalition in its statement also welcomed and applauded a new step for business in the Arab region with the establishment of the Arab Coalition of Service Industries. The statement highlights the interest of the Global Services Coalition in working this new industry organisation. ESF signed a joint statement released on the 6th April 2012 outlining concerns regarding new legislation put forward by the government of Japan that will place Japanese consumers and businesses at a great disadvantage by ignoring the longstanding concerns raised by international industry about creating equivalent conditions of competition. ESF signed a multi-association letter sent to Prime Minister Singh of India on the 4th April 2012 expressing serious concerns with new Preferential Market Access (PMA) rules issued by the Indian Department of Information Technology. The letter highlights an overall concern and urges the Government of India to rescind this PMA entirely and initiate a consultation process with the private sector and other stakeholders to more effectively address India’s security and economic concerns. On the 6th March 2012, ESF and ECIPE held a seminar aimed at exploring the potential of a plurilateral agreement in services. The seminar drew in participants from all quarters with an interest in international services trade. The discussion was lively and the overall feeling was positive yet mindful. The panel included: Michael Punke, Deputy USTR, US Ambassador at the WTO; Hosuk Lee Makiyama, Co-Director, ECIPE; Vital Moreira, Chairman of the International Trade Committee of the European Parliament; David Plunkett, Ambassador of Canada to the EU; Tim Yeend, Australian Ambassador to the WTO; Sören Kelstrup, Chair of the EU Trade Policy Committee under the Danish Presidency of the EU; Marc Vanheukelen, Chief of Staff of EU Trade Commissioner Karel De Gucht; Robert Vastine, President US Coalition of the Service Industries; Pascal Kerneis, Managing Director ESF; Introduction from Jonathan Peel, EESC Member Employers Group; Conclusions from John Cooke, Chairman, LOTIS Committee TheCityUK; and Moderated by Edward Bowles, ESF Policy Committee Chairman, Regional Head of Public Affairs, EMEA and Americas Standard Chartered Bank. See Programme. ESF sent a letter to Ignacio Garcia-Bercero, the EU’s chief negotiator in the India trade talks reiterating the need to secure commitments for the services sector during the crucial lead up to the Summit in February. The letter was sent on the 5 December 2011 and is available here. ESF signed a joint industry communication on Trade Finance and the Basel Framework issued on 1 December 2011. The communication outlines support for policies that aim to strengthen the resilience of the financial services sector, as promulgated by the G-20, but restates continued concern about the unintended consequences of the regulatory treatment of trade finance instruments under the Basel framework, which does not reflect the risk profile of trade finance assets, nor does it take into account the adverse effects of the proposed changes on global trade and growth in the real economy. Available here: Part 1, Part 2. ESF signed a joint letter sent on the 29 November 2011 on Intra-Corporate Transfers to Members of the Committee on Employment and Social Affairs at the European Parliament. The letter is concerned with the draft Intra-Corporate Transferee Directive and the Committee vote on December 5th stressing the need to support the original objectives of the directive. Available here. The Global Services Coalition (GSC) and Financial Leaders Working Group (FLWG), both of which ESF is a member of, released a Statement on the 21st November calling for new International Agreements to safeguard the provision of Cross-Border Data Flows. The European Services Forum sent this statement with covering letters to the Commissioners in charge of Trade, Home Affairs and the Digital Agenda, further highlighting the importance of Cross-Border Data Flows for international trade in services. See Statement here and letter here. On the 21st of November 2011, ESF sent a letter to the European Parliament’s International Trade Committee (INTA) Chairman, Vital Moreira, and the competent rapporteurs and shadow rapporteurs outlining the European services industry’s desire to see a quick approval for the highly ambitious trade agreements, which will strongly benefit all countries during the current difficult global economic climate. See letter here. On the 9th of November 2011, the ESF Policy Committee Chairman sent a letter in accompaniment to the ESF position paper on Malaysia to DG Trade Director-General Jean Luc Demarty. The letter and paper sets out the European Services industry’s priorities in the negotiations with Malaysia for a Free Trade Agreement. Letter and position paper can be found here. On the 24th of October 2011, ESF and BUSINESSEUROPE sent a letter to Commissioner Barnier, Commissioner De Gucht and Vice-President Tajani expressing strong concern regarding the proposed regulation on capital requirements for banks due to the negative impact it will have on trade and export finance. Trade finance, which is essentially a means of payment and a guarantee mechanism for the movement of goods and services, has historically maintained a low risk profile. If adopted and implemented as currently defined, the new capital and liquidity requirements of CRD IV will seriously reduce the availability of short term trade and export finance. The restriction of trade finance products for European businesses will ultimately threaten the recovery of the global economy, since European banks are providing a very large share of the world’s needs in financing international trade. Letter here. On the 3rd of October 2011, the European Services Forum sent a letter to Trade Commissioner De Gucht conveying its assessment and concerns regarding the EU’s investment policy towards China. This letter was sent as a follow-up to the ESF secretariats response to the Commission’s consultation process on this topic in July. China undoubtedly holds much potential that is yet to be realised and given the importance of investment in establishing services suppliers in new markets the European Services Forum encourages, in principle, efforts to review the investment landscape and implement well-considered strategies to ensure that China is an open, secure and welcoming market for European investments. However, the approach adopted must be based on practical considerations of commercial interests, existing Bilateral Investment Treaties (BITs), time scales, the need to maintain the highest levels of protection, a sound dispute resolution mechanism and the practicalities of negotiating pre-establishment market access. As such, future investment policy towards China must build on a comprehensive assessment. On Friday 15 July 2011, the European Services Forum submitted a letter to Joint Secretary Prasad in response to the Indian Department of Industrial Policy and Promotion’s discussion paper: ‘FDI Policy Rationale and Relevance of Caps’. The letter highlights the close relationship between FDI and the services sector and draws attention more generally to the importance of FDI and an open transparent policy framework to a healthy economy. The letter goes on to address the specific questions raised by the discussion paper with a general focus on the detrimental effects of equity caps and the positive results that can be achieved sectorally through non-discriminatory regulatory frameworks that fairly treat foreign companies like all domestic companies. Within this context the letter also draws attention to freedoms enjoyed by Indian companies within the EU market. The European Services Forum has always supported better mobility for highly skilled service providers with the rationale that it is important element in driving European economic activity. The adoption of the Proposal for a Directive on conditions of entry and residence of third-country nationals in the framework of an intra-corporate transfer (COM (2010) 378 final of 13 July 2010) has therefore been actively supported by ESF at each European level. In further support of this important issue the ESF has endorsed a joint business association letter (22 June 2011) addressed to the European Parliament supporting the proposal for a directive on Intra-Corporate Transferees. The letter is available here. Against the backdrop of global work on economic recovery and regulatory reform it has become important to reinvigorate efforts to open trade in financial services. The role of financial services as an essential driver of increased trade and investment flows underpins the European Services Forum’s endorsement of the Reinvigorating Open Trade in Financial Services paper, which highlights the critical role vibrant financial markets play for both companies and individuals and the importance of a transparent and sound regulatory environment. The paper’s message and content are pertinent to all international trade negotiations. The European Services Forum has followed-up on its June 14th 2010 letter to Trade Commissioner Karel De Gucht, where it vocalised the services industry’s support for the renewed EU-Mercosur trade negotiations, with a letter and detailed position paper outlining the specific priorities of the European services industry (April 8 2011 Letter and Position Paper). The letter reiterates the importance of placing services at the top of the negotiating list and of achieving progress in Public Procurement access and treatment, investment security, and also of putting agricultural interests into perspective. The position paper provides further details of the horizontal and sector specific issues that need to be addressed in this trade agreement if it is to contribute ambitiously towards development in Latin America and growth and employment creation within the EU. On the eve of the EU-India Summit in Brussels on 10 December, the European Services Forum calls on the leaders of both sides to give a strong signal to the Free Trade Agreement negotiators demonstrating emphatically that their objective is market-openness and that their goal is an ambitious agreement that will deliver material opportunities to the economies and citizens of both parties. The resultant FTA would spur an advantageous expansion in global trade when it is vitally necessary to so do. It would give European businesses access to a huge potential market with a strong and steady growth rate (see Press Release). The European Services Forum sent to EU Commissioner for Trade, Karel De Gucht a detailed analysis of the priorities of the industry on the horizontal front, as well as in the various services sectors, sector by sector (see letter and detailed Position Paper). On the 7 December 2010 the European Services Forum’s Policy Committee Chairman, Richard O’Toole, sent a letter to the Commissioner for Internal Market and Services, Michel Barnier, regarding the European Commission’s Green Paper – Audit Policy: Lessons from the Crisis. The letter supports the need for a framework embodied in the EU’s 8th Directive on Statutory Audit, but also details the concerns of the services industry, particularly regarding the installation of measures that might impose an artificial restriction on trade, and therefore distort the market and further limit choice for companies. See the letter here. At the 19th Japan-EU Summit of 28 April 2010, the EU and Japan decided to establish a joint High Level Group (HLG) to identify options for strengthening all aspects of Japan-EU relations, including trade and economic aspects. The Commission subsequently launched a public consultation on the future of EU-Japan trade and economic relations. The European Services Forum, as a key stakeholder, provided feedback to this consultation on 5 November 2010 outlining the opinion of the European services industry. See contribution here. The Global Services Summit that took place in Washington on 22 September 2010 concluded with a call for the G20 and APEC Leaders to use their upcoming meetings to put services trade negotiations front and center in the global trade agenda (see Final Communiqué). The Summit urged the G20 to engage vigorously on services and make a determined effort to engage in services market access negotiations, before leaders convene in Seoul in November. At the occasion of the 2nd Global Services Summit in Washington, the Global Services Coalition released a statement on the benefits of services liberalisation for the economic development of the developing and emerging countries. ESF Response to DG Trade Public Consultation on future trade policy called the Commission for always keeping trade in services and investment in the top priority of the new EU Trade Policy and urged the EU for new efforts in concluding the DDA round, encouraged the negotiatros to pursue the bilateral trade agenda initiated by the “Global Europe” Strategy in 2006 and to further focus on the emerging markets. For a copy of the ESF Response, click here. In a letter to EU Trade Commissioner Karel De Gucht and U.S. Trade Representative Ron Kirk, several European and U.S. business groups, including the European Services Forum, urged both the United States and the European Union to press for advanced developing countries, particularly Brazil, China, and India, to participate in the Doha Round sectoral negotiations and to provide substantial and meaningful improvements in market access in services. For a copy of the letter, click here. “The European Services Forum is strongly in favour of concluding a free trade agreement with Singapore, which can serve as an ambitious benchmark for future agreements in the region.” That was the essence of the message sent by ESF Chairman Christoffer Taxell on 12 July 2010 to EC Commissioner for Trade, Karel De Gucht, on the European Services Industry Priorities on EU-Singapore FTA negotiations. On 5th July 2010, the Global Services Coalition expressed their appreciation to the G20 leaders’ support for bringing the WTO Doha Round to a balanced and ambitious conclusion. However, the global services industry representatives also expressend their concerns that no date was set for the conclusion of the Round, and urged the G20 and WTO members to work vigorously to ensure that it be completed as soon as possible. The European Services Forul sent today (25 June 2010) its views on the forthcoming new investment policy of the European Union, to EU Commissioner for Trade, Mr. Karel De Gucht, who is meant to announce the new policy in the coming days. The European Services Forum notes that the Lisbon Treaty brought foreign direct investment (FDI) into the ambit of the EU’s Common Commercial Policy and notes the valuable opportunity that this development provides for the European Union to rationalise the policy of the Union and its member-states on investment questions, and to bring greater weight and comprehensiveness to EU FDI policy towards the rest of the world. ESF draws the attention on the fact that the WTO General Agreement on Trade in Services (GATS) is an investment agreement as well as a trade agreement. However GATS only provides pre-establishment protection. Our companies also need post-establishment protection for their investments against unfair expropriation or nationalisation. In this context, ESF strongly welcomes the adoption of a new European Union Investment Policy that will open the way for negotiations of bilateral investment treaties (BITs) at EU level, bringing uniform benefits to services businesses across all European countries. ESF Chairman, Christoffer Taxell, sent on 14th June a letter to European Commissioner for Trade, Mr. Karel De Gucht, supporting the resuming of the EU-MERCOSUR Trade negotiations. The letter is reminding the overwhelming importance of services and manufacturing in the economies of both regions, which should therefore drive the negotiations instead of the talks on agriculture that seems to capture too much attention. The European services industry is calling for an ambitious agreement, with significant progress made in the services commitments by the EU’s trading partners, and for a short negotiating time table. Other EU Institutions have received a similar letter. The Global Services Coalition issued a letter to G-20 leaders on 10 June 2010, calling on them to continue to resist enacting protectionist measures, and to conclude the Doha Round. The G-20 is scheduled to meet on June 26-27 in Toronto. The Australian Mission to the European Union organised a seminar 31 March 2010 in partnership with the European Services Forum. The seminar entitled “Growing Services Trade’ EU Services Directive – Implications for EU’s trading partners” (see programme) gathered around 80 participants representing business community and diplomatic missions. The presentation by ESF Director showed the importance of the intra-EU trade in services and the attactiveness of the European Union for the foreign investors. The implementation of the services directive should even further strengthen this trend by improving the competitiveness of the EU internal market. ESF sent a letter to EU Trade Commissioner Karel De Gucht on the European Services Industries Priorities for the EU-Canada Comprehensive Economic Trade Agreement – CETA. The Annex analyses the horizontal and sector specific priorities of the various services sectors for these important trade negotiations. European Services Forum issued a Press Statement at the occasion of the on-going trade negotiations rounds between the European Union and Colombia & Peru on one side, and with the EU and Central American Countries on the other side. ESF organised yesterday, 23rd February, an informal cocktail in the framework of the painting exhibition on “Cubism” at the Musée d’Ixelles in Brussels. The show is sponsored by Telefónica, the largest European investor in the region. The gathering was an excellent opportunity for the business community to express to the negotiators their support for the agreement. ESF is following with great interest these on-going negotiations. and hopes that this will be the last round with Colombia and Peru, so that the initialing of the agreements can take place at the European Union- Latin America & Caribbean Countries Summit in Madrid next May. The New ESF web site includes a new section on Bilateral Negotiations, with documents on services related issues on most concluded free trade agreements by the EU which do content commitments on services, as well as on the numerous on-going bilateral and regional trade negotiations. A “Facts & Figures” section has been added, that contains statistics on trade in services. The “interesting links” section has been extended. Finally a restricted “Members Area” has been inserted. Comments are welcomed. Please refresh your “favorites” if need be.